"The View of the Library at Strawberry Hill." Object type: Mezzotint Engraving, Johann Heinrich Müntz, 1756. We know from Ian Watt’s influential “triple rise” thesis that novels were critical to the rise of the middle class. The idea is that people in this newly privileged, newly leisured class had to learn how to behave; the novel was one way that a group far too big and complex for its members ever to know each other personally could nevertheless witness itself as a group, with shared values, habits, and beliefs, through things like prose narratives. In other words, the novel was an outward way that inward behavior could be modeled, contemplated, discussed—even internalized. The theater offered another such means. We know (in part from novels themselves!) that the theater, which was changing to reflect middle class values, became an important crucible for polite behavior; it was moreover a place where the middle class might congregate and observe itself as a class. Without these institutions, or others like them, the middle class could never have coordinated itself, could never, in other words, have emerged as a class. Architecture deserves to be added to this list. Country-house tourism, visits to the lives of the (newly) rich and famous, emerged over the course of the eighteenth century as a going concern—with rules, rights, and its own decorum. If you owned a nicely appointed country villa, you would in short have done well to arrange official hours for visits, for people would be curious to see. This tradition continues, of course, to the present day, where well-known houses (the house containing Francis Bacon's stained-glass, for instance) appoint a fixed time for casual visits. Speaking historically, the rise of an interest in the houses of others also helps account for the surprising popularity of auction catalogues, made up of the estates of the recently deceased. It is not only through these catalogues that present-day researchers (myself included!) get a sense for what people owned; it was also how their contemporaries might know what someone like Joseph Addison socked away in his library. Finally, the same interest accounts for the published “descriptions” of the homes and grounds of especially well-known homes—of, for instance, Pope’s grotto and garden, published in the year of his death (see Exhibit 8). Surely here is the origin of a long line of glossy genres: Country Life, Better Homes and Gardens, and even Dwell (whose non-glossiness is a paradoxical part of its polished appeal). Walpole, Description of the Villa (1784): LWL Folio 33 30 copy 11. Image courtesy of The Lewis Walpole Library, Yale University. No house was more publicly private, more staged for consumption by country-house tourists, than Horace Walpole’s paradoxical retreat: Strawberry Hill (left). Walpole “complained” that he was over-run with visitors, but this was the whole point of his astonishing experiment, his eye-catching, neo-gothic “castle” in Twickenham by the Thames. The house was custom-built by Walpole, converted with pasteboard battlements and stone-pattern wallpaper. But it also housed an astonishing collection of antiquities, mostly from the English and British past. When his collection was finally broken up—long after his death, in 1842—the house and grounds were swamped with gawkers; the auction of his belongings took 42 days, and was a regular presence in London’s daily newspapers. But this was only the bursting of a dam. During his own lifetime, Walpole allowed visits, nearly every day, though only by appointment and with a ticket. And he published a book-length Description of Mr. Walpole’s Villa, first in 1772, and twice updated—with surprisingly detailed, intricately realized engravings of principal objects and views. This was a private residence, in other words, deliberately constructed in the public eye. Strawberry Hill, as seen from the lane that fronts it. The Beauclerc tower is the conical roof nestled behind battlements. Drawing by Edward Edwards. Image used with kind permission of The Lewis Walpole Library, Yale University. Walpole was less interested in the emergence of the middle-class than he was in himself—in elaborately staging himself as a public (and publicly private) figure. The public staging of privacy is the central paradox of Strawberry Hill. And it is nowhere more strongly realized than in a single space (which contained a nested series of spaces) that was not available to be seen on the tour. This was the so-called Beauclerk Closet, a small, octagonal space that is the only room in the specially constructed Beauclerk tower, which is (in turn) perched in the nearly inaccessible Northwest corner of the house. Like William Hay’s stone (Exhibit 15), which was embayed in a case, then wrapped in vellum, so too the tower was built to enclose a particular object, a scarce copy of Walpole’s only attempt at writing for the stage. The tower and the closet it contains alike take their names from the author of seven soot-water drawings: Lady Diana Beauclerc, the on-again, off-again wife of Topham Beauclerc. These seven drawings are of scenes in Walpole’s Gothic drama The Mysterious Mother: A Tragedy, and they were at one time displayed in the tower. Though posterity has not been kind to it, Byron was among the play’s Romantic-era admirers, calling it “the last tragedy in our language.” It is this play, and the drawings of this play, that the closet and tower were specially built to encase. The Description of Mr. Walpole’s Villa makes this redundantly clear. I’m not going to ruin it; I’m not going to ruin the mystery of the Mysterious Mother. The whole play is about sustaining a central question—and I’m not going to be the one to wreck it. But it is important to know the way the play works. As the play opens, the Countess of Narbonne (the mysterious mother of the title) has been publicly grieving for the past sixteen years; she confines herself mostly indoors, appearing only occasionally to do public penance through various ritual humiliations. Nobody, however—not the clergy nor her closest advisers—knows what she is doing penance for. This is the mystery. Her husband, it is true, died sixteen years earlier; also sixteen years ago, she exiled her son, ostensibly for an indiscretion with a chambermaid. But the connection between these events, if there is any connection, is unclear, and her penitence seems out of proportion with what might have been her grief. The question is particularly pressing because, as we might expect in a tragedy, the fate of the community hinges on discovering the “guilt” and “mysterious crime” to which she continually alludes but which she will not reveal. Something is rotten in Norbonne, a publicly secret guilt that the play promises to expose. The action of the play is therefore largely negotiated in the public commerce of the Countess’s private guilt; an intimate question of psychic interiority is aired out as the continual topic of conversation in the marketplace. 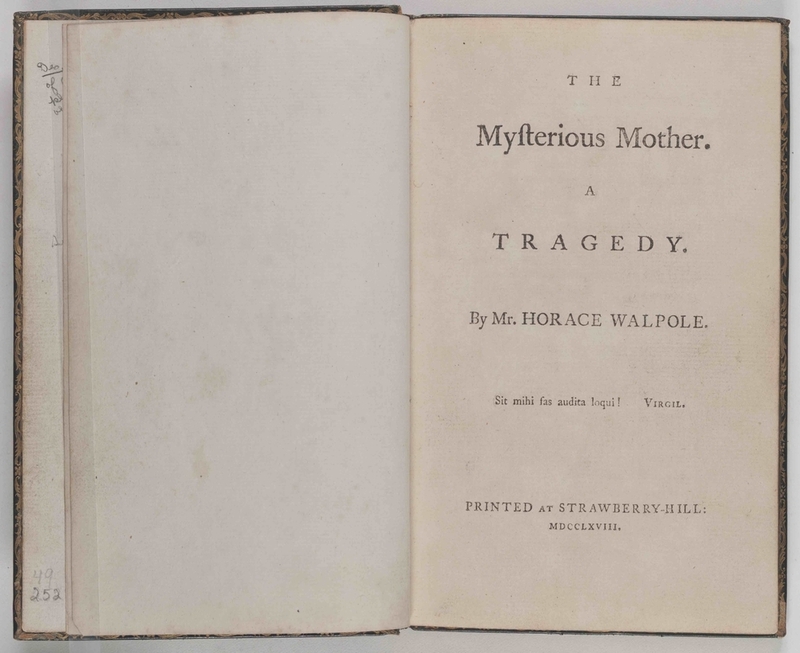 The Mysterious Mother, Walpole's personal copy of this scarce play. A manuscript note on the paste-down (just visible behind the left-hand page) indicates that this copy was specially prepared to be kept in the Beauclerc Closet. Image courtesy of The Lewis Walpole Library, Yale University. The mystery of The Mysterious Mother was heightened by the circumstances of its limited circulation. A curious eighteenth-century reader could not simply pick up a copy of the play to see what it was about. It had been printed in 1768 in a small edition of fifty copies at Walpole’s private press. These were circulated strictly among close friends—Lady Diana Beauclerc among them—with a request for suggestions and advice, anticipating a corrected edition to be forthcoming. This corrected edition, however, never appeared. It was advertised, but never published. After reacquireing what copies he could, Walpole placed his personal copy (above) of The Mysterious Mother in a desk drawer, and built a tower and closet specifically to contain it. It became, that is, what in the specialized vocabulary of drama studies is known as “a closet drama”—a play designed never to be staged. The critical thing is just this: people reported knowing about the play. It was advertised; it appeared in the description of his house; the difficulty of finding a print copy is attested in part by the multiple manuscript copies of the play still surviving. Finding a copy to satisfy one’s interest, however, was exceptionally difficult. Among the only known copies was the most famous of them—the one Walpole advertised in his closet. The wonderful thing—the really amazing thing about this play—is that it, itself, expresses psychic interiority through architectural metaphors, metaphors that the two scenes of the play repeat. The question, continually turning up in the marketplace, concerns what lies, in the play’s words, “within,” “behind,” “in,” or “beneath” the expressions of guilt and contrition that the Countess continually and oracularly voices. So, too, with the setting; the play only shifts scenes once, from the platform in front of the castle, to the garden within it. The scene of action progress relentlessly inward. Interiority, as the play imagines it, is a syntax, which is rediscovered in the setting of the drama, moving inexorably from courtyard to closet. The sense is that if you could just get into the recesses of the Countess’s castle, you would be able to know the secret that she seems to be harboring in the recesses of her mind. Strawberry Hill, plan view. Entrance is at the bottom right. The Beauclerc tower is the hexagonal room nestled in the upper right corner. Exit is at the top left. From Walpole, Description, photo by curator. Much more could be said about this play; indeed, I myself have much more to say about it, which can be found in the exhibit catalogue for this museum. For now, I just want to note a few things. The first is that Walpole learned many of the tricks for Strawberry Hill from Canterbury Cathedral (Exhibit 17). This includes the layout of the house, which stages views of antiquities along an increasingly inward trajectory. Strawberry Hill, like Canterbury, was a machine of interiority. The tour proceeded from the highly public, airy and open spaces, like the central stairwell (lower right), to the increasingly cramped and dusky spaces, like the “Tribune” (upper-right). One clue to its debts is an object in the Tribune-- a small casket strikingly like the one owned by William Stukeley (see Exhibit 17), a piece of enamel-work displaying the murder of Becket (and possibly made to contain fragments of his blood and bone). But the tour, at least according to the catalogue, didn't end here. If you had read the catalogue, you would know where the tour was leading, even before visiting; it winds up at the Beauclerc Closet, with its desk and its play. We have at least one journal entry about visiting Strawberry Hill-- by the novelist Frances Burney-- that notes that the play was one of the reasons for visiting the house; Burney visited in part to get her hands on the play she had heard so much about. There is, however, a twist. Though visitors (even Burney!) could read about the closet, and could read encomiums about the play in its public advertisements, they were thwarted from seeing space, or reading the book. These, Walpole insisted, were to be “kept sacred,” and “not shown to the vulgar.” In other words, the room was left a mystery in the house, just as the mother’s mystery is left mysterious in the play. As such, the house repeats the strategy of the play-- offering and sustaining a "mystery" as one of its central attractions. Lady Diana Beauclerc's untitled drawing of the penultimate scene in The Mysterious Mother. Original at the Lewis Walpole Library, Yale University. I want to end with a note about those those seven soot-water drawings (one of which, specially singled out by Walpole, hangs in this museum-- reproduced at right). Walpole at one point in his life let slip something about himself, and the little printing house he ran on the grounds of Strawberry Hill. A large print run, he noted, would often languish on the shelves, whereas a small run, by virtue of its very scarcity, would fly off the shelves in days. The lesson was clear; something could be made desirable just by withholding it. When Walpole’s collection of antiquities was broken down and sold, John Anderton went to see these drawings. He was an interested observer, who had read about the drawings in the printed Description, but had never managed to see them. Like the closet and the book, they were publicly celebrated, but impossible to see; Walpole lavished them with encomiums, but withdrew them from circulation. He was, however, to be disappointed. “They are but poor drawings,” he noted, “and independently of the circumstances claim no attention.” This might be true of everything-- that independently of the circumstances, they claim no attention. But it is especially true in Strawberry Hill. Likewise with The Mysterious Mother. The book itself (above) is a bit of a disappointment; it is small, plainly bound-- insignificant apart from its context. It is a sign of the effect they produced that, like Pepys’s stone or Becket’s blood and bone (Exhibit 16 and Exhibit 17), they only signify because of the cases in which they are put. The drawings, like the bejeweled casket concealing the shrine of Thomas Becket, or Pepys’s specially constructed stone-case, conceal in order more explicitly to display; they are where unspeakable difference is rendered up in the public discourse of inwardness.